Pollen grain collected in the Kaweka Mountains of New Zealand in October 1924. Plants of the Nothofagus genus were some of the last species to persist in Antarctica after cooling and glaciation intensified about 33.7 Ma. Today, they are found throughout the Southern Hemisphere in regions like New Zealand and Patagonia. This specimen is one of the many morphotypes of G. etrusca. This dinoflagellate cyst species is endemic to the Black Sea and the Mediterranean region in general. Its morphology (especially the periphragm and the central body) changes in response to sea surface salinity changes. Confocal image of dinoflagellate cyst Lingulodinium machaerophorum from recent sediments in the Black Sea (GeoB7625-2). This species shows a notable increase in process length during the Holocene, related to salinity variations caused by Mediterranean inflow/Black Sea outflow (Mertens et al. 2012). Pollen image reconstructed from a stack of confocal images. A member of the Winteraceae family, native to New Caledonia. The plant has many primitive evolutionary features. The plant is a member of the family Loranthaceae (Mistletoe family). The pollen of this taxon resembles some of the fossil forms of Aquilapollenites. Native from India to Viet Nam and western Malaysia. 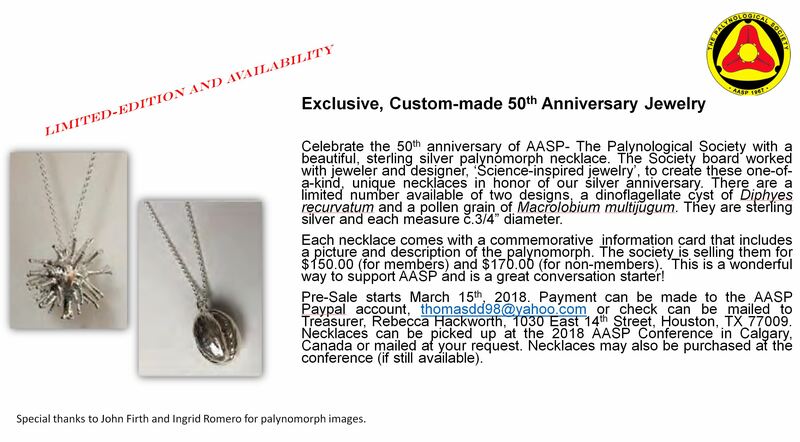 AASP – The Palynological society (AASP-TPS) was founded to promote the science of palynology for and in behalf of the public interest. It is a non-profit organization, to foster the spirit of scientific research among its members and others engaged in this field of science. It also aims to gather information and data on this subject that is disseminated to its members and to the general public. AASP-TPS was established as the “American Association of Stratigraphic Palynologists” following a survey conducted by Herbert Sullivan in spring of 1967. It held its first meeting on December 8, 1967 in Tulsa, Oklahoma.